Imagine you’re the rock-climber, Alex Honnold, and you’ve just completed the first-ever free-solo (no ropes) climb of El Capitan in Yosemite. How did you get to this point? Long ago, you learned you would need new capabilities: finger strength, mastery of climbing moves—e.g. stemming, smearing, heel hooks—and more. Then you went to the climbing gym and worked on these capabilities, measuring your steady progress on them over several years. track their progress in improving these capabilities. Our new B2B Growth Diagnostic helps you do this. It’s quite simple: We send you an online survey link which you distribute to your employees. They confidentially assess your business on 24 “growth habits,” and we send you a 20 page report. You’ll see how your business compares to average, top-quartile, and top-decile businesses on each growth habit. And you’ll get recommendations for your “improvement plan.” But why did we select these 24 growth habits? It all starts with a clear goal. Can we agree that your business life will be better if you achieve organic growth that is rapid, profitable and sustainable? Shareholders will applaud, activist investors will pester some other company, customers will respect and want to work with you, employees will have rewarding, stable careers, and competitors will be annoyed by your unrelenting success. Nice. Quality upgrades: Quality is usually expected today. Even if it boosts revenue, you’ll reach diminishing returns without new offerings. Productivity gains: This doesn’t impact the top line. It also reaches a point of diminishing returns since you upgrade existing assets. Cost cutting: Again, no top-line impact… and this can actually degrade future growth if it cuts into needed capabilities. Sales training: This helps top-line growth, but reaches diminishing returns unless you deliver new customer value. Customer intimacy: This also improves the top-line… but as with sales training, you reach a point of diminishing returns. Global expansion: This is good for the top-line, but you’ll eventually run out of high-growth “developing” regions. Acquisitions: You’ll have short-term growth, but no sustained growth without organically growing acquisitions afterwards. So are you with me on this goal? If you decide to make “understand and meet customer needs” your primary goal, what growth capabilities do you need to reach this goal? What growth capabilities do you need? When Alex Honnold was climbing El Capitan, were most of his moves second-nature to him? You bet. What are the growth habits you want in your business… that employees naturally do every day when no one is looking? 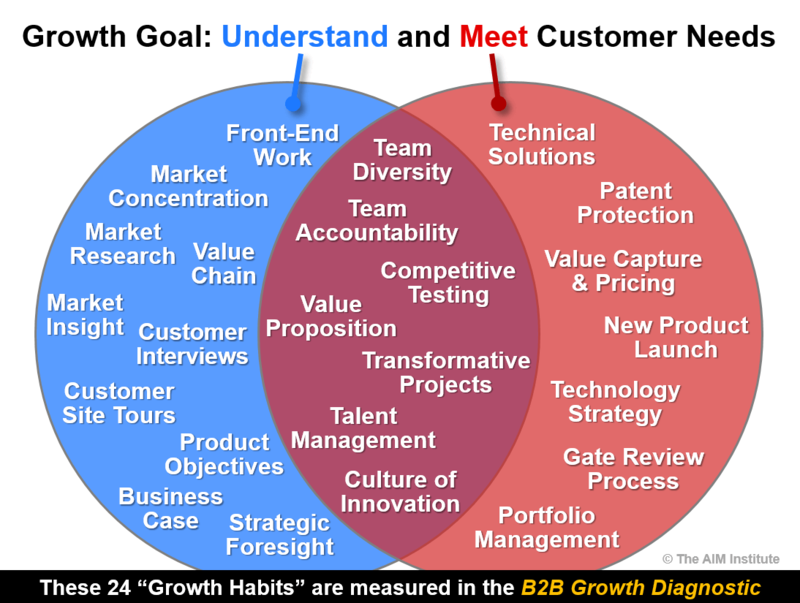 These are the 24 growth habits included in the B2B Growth Diagnostic. As this Venn diagram shows, some impact your ability to understand customer needs… some your ability to meet those needs… and some both. Just like the climber seeking world-class performance, you should begin with a frank appraisal of your current capabilities. 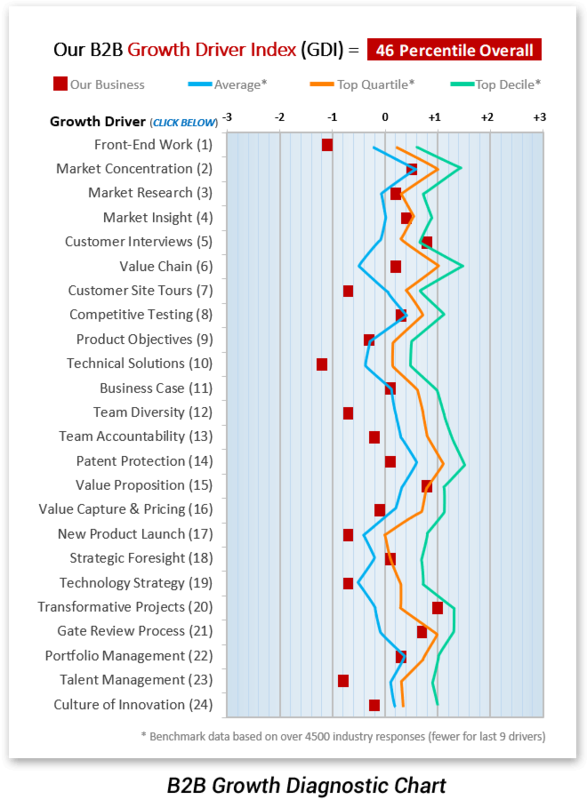 For each growth habit, the B2B Growth Diagnostic benchmarks you against average, top quartile, and top decile businesses… drawn from The AIM Institute’s database of over 4000 respondents. The main deliverable in your 20-page report is the chart shown here. Respondents place your current capabilities (red markers) on a range from -3 to +3 for each habit. You’re benchmarked against average, top-quartile and top-decile performers (blue, gold and green lines, respectively). 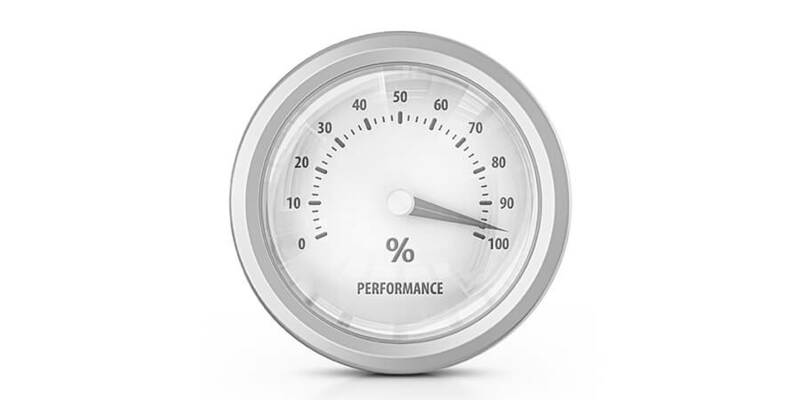 You’ll also see your overall benchmark position (49 percentile in the sample). There’s enormous room for improvement for all B2B companies. 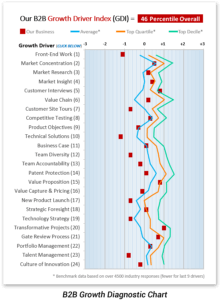 Even top decile businesses score far below the +3 ratings… which represents optimum growth behavior. 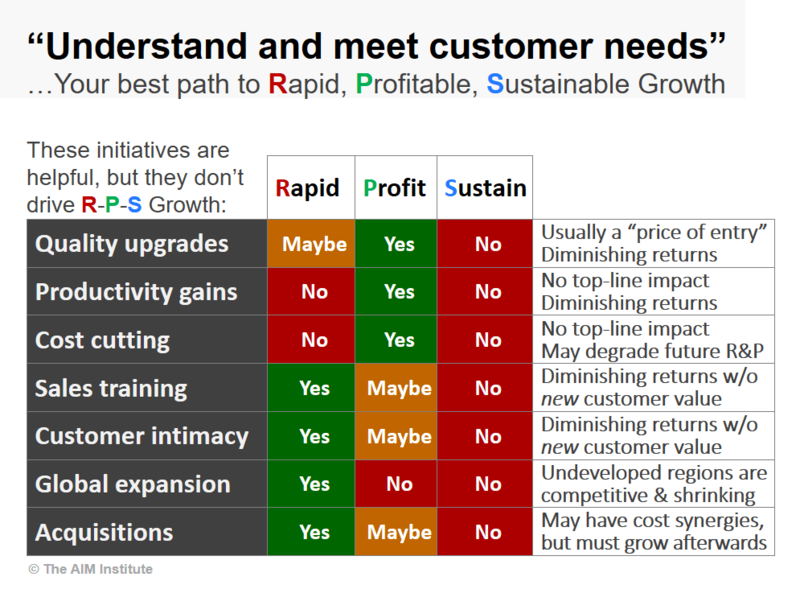 Your biggest growth “lever” is probably in understanding customer needs. 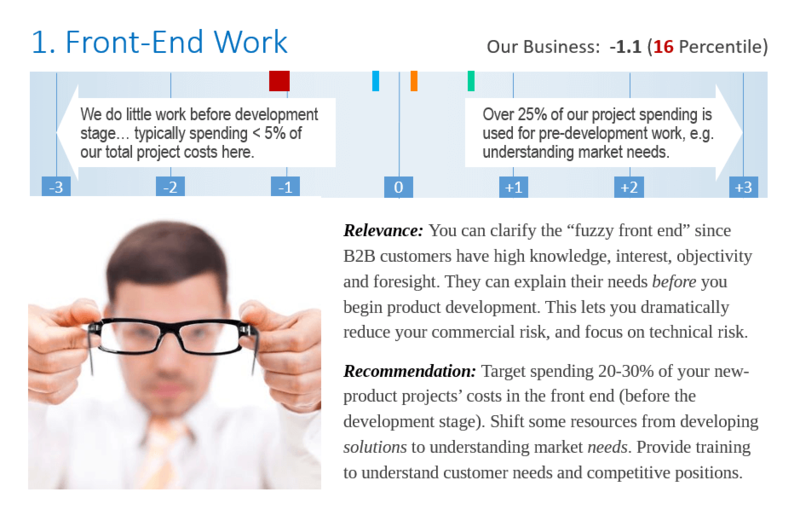 You can try hiring smarter R&D to meet customer needs, but you’ll grow faster by upgrading B2B customer insight. For more, see our latest white paper, Guessing at Customer Needs. Depending on which growth habits you pursue, The AIM Institute may not be able to help you. But we probably know someone who can. We work closely with the non-profit Institute for the Study of Business Markets (www.isbm.org) and are happy to connect you with their experts. So it’s no accident that this survey separates management and employee responses. Imagine a CEO has this survey run annually for each business. It will become quite apparent what condition each business is in… and more important, whether it is getting better or worse. Simply put, if you want anything more than undiluted, short-term financial fixation, you must shine the light on the behavior you seek. I’d like to close with some good news. Most B2B business leaders today have not yet begun a “world-class climbing effort” to achieve rapid, profitable, sustainable growth. With concentrated effort now, you can build growth capabilities that will leave competitors on the ground looking up at you. In every industry, some will count on wishful thinking… and others on a serious climbing program. To start your journey, visit B2B Growth Diagnostic or contact us.